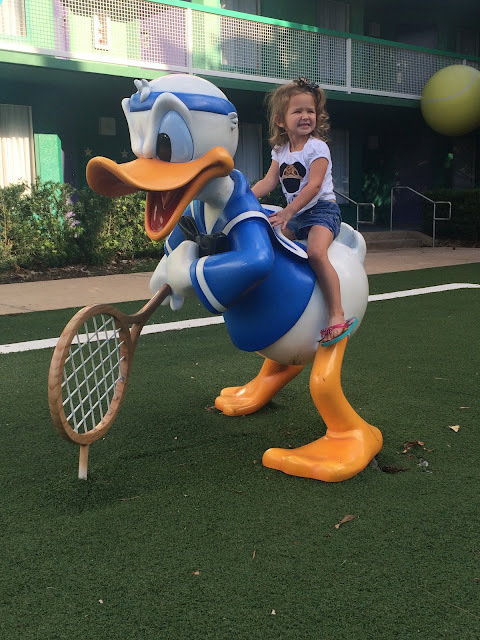 This year's trip to Disney World was booked on a whim, so we were on a quest to stay within budget. In order to take advantage of the incredible Disney offer that fit our price range, we had to stay at one of the All-Star Resorts. I have no problem staying in a value resort on Disney property because we don't really spend a tremendous amount of time in the room. Plus, they are always clean, impeccably themed, and come with all the perks of any other resort hotel. 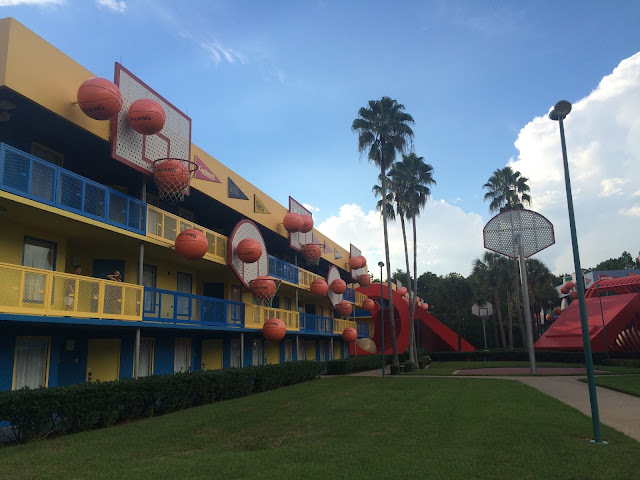 Even though we had stayed in a value resort before, everything we had read until that point suggested that Pop Century was still light years ahead of the AllStar Resorts, which are All Star Sport, All Star Music, and All Star Movie. One of the main complaints I read was that all three of these resorts shared a bus, making it nearly impossible to use Disney Transportation. After much research, I determined that "bus sharing" only occurs during low tourism seasons. Fall Break can go either way, so to err on the side of caution, I booked All Star Sport since it would be the first pickup on the bus loop. For the record, we never once shared a bus. 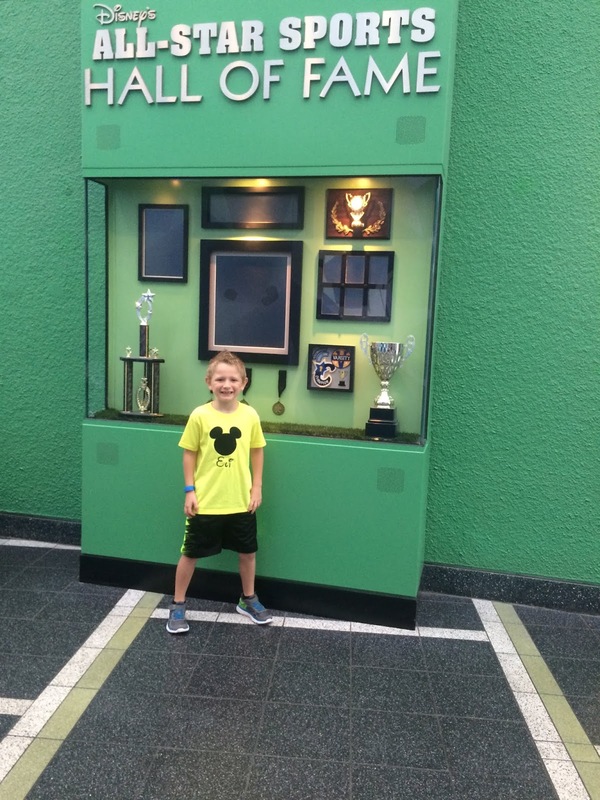 Eli was beyond thrilled with our selection and felt really special that we picked his recommendation. I was really nervous about our choice because on arrival day, we still had not received confirmation of our room number by the time we got to Orlando. I always do online check-in, so I knew this was unusual. Eric was on the phone with the resort when the text notification came through telling us our room location. I would highly recommend online check in because it allows you to bypass the check in line and go straight to your room or hit up a park. When the text came through with our room number, Eric immediately looked it up on the resort map. Unfortunately, my accommodation requests were not met, and we were put far from the location I had wanted. Unless you pay for a Preferred Room, this is always a possibility. A little disappointed, I stopped at the front desk to request a room change. In true Disney form, they agreed, but their only availability was also a far walk from transportation, so we kept our original room. It ended up being a wonderful location and I really can't image a better spot. 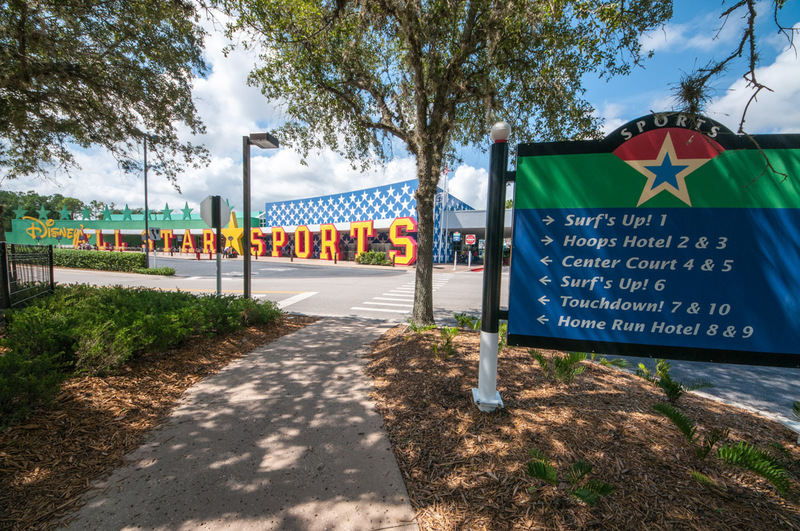 One of the things I liked the most about the All Star Sport Resort was its size. It is much smaller than the other Disney properties, so what I thought would be a long trek to the main building and transportation stop was actually a very short and easy walk. Plus, we had an end room so we had a quiet location with easy access to our car and the parking lot. This came in very handy as well because there was a McDonald's just down from our resort that Eric went to a few times since we didn't have a meal plan. I will also say this about the All Start Sport Resort, if you have kiddos, especially sports-loving kiddos, this is a fun and well-themed option for your family. 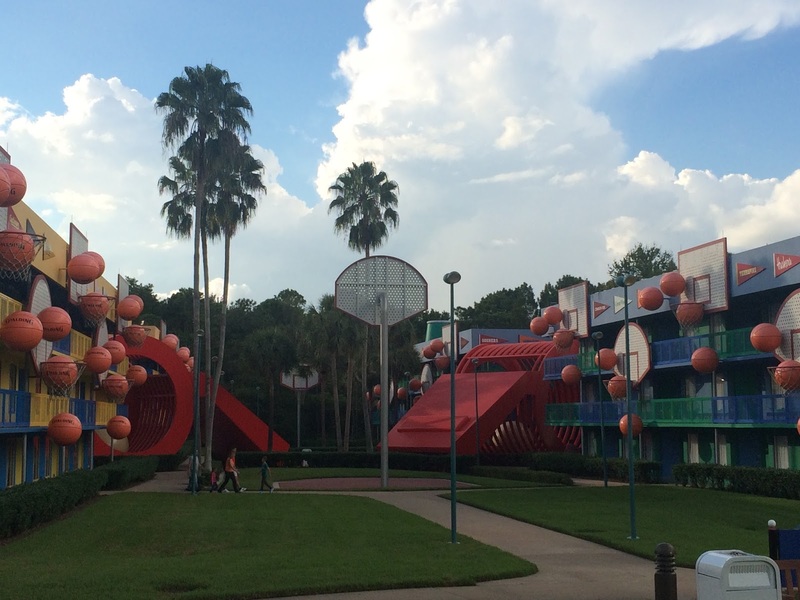 Our kids understood the theming more than they did Pop Century. We were in the Tennis section, which was one of the furthest away from the main building. As I mentioned earlier, I was a bit concerned about the location but the resort is small enough that it wasn't a major issue whatsoever. In fact, a leisurely 3-5 minute walk was all it took to reach the main buildings and areas. As for the rooms...they are basic, but very clean. 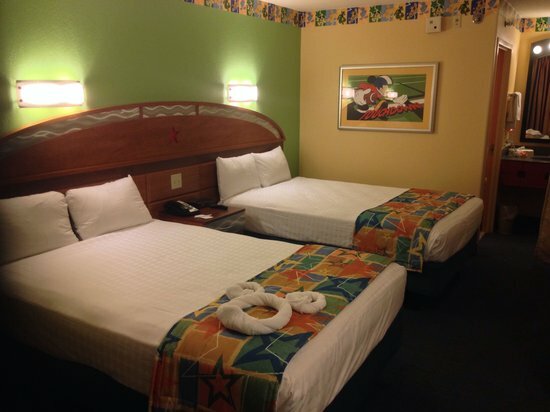 We don't spend a tremendous amount of time at the resort when we vacation, so for us the size is not a problem. Each room is equipped with two full-sized beds and a small table that separates the two. Across from the sleeping area is a small armiore, which holds a television and a "hidden" mini-fridge for the room. Next to the fridge are drawers for storage during your stay. You will also find a table with two chairs. Again, we are rarely in the room, so for us, the table isn't used other than to catch items as we come and go. 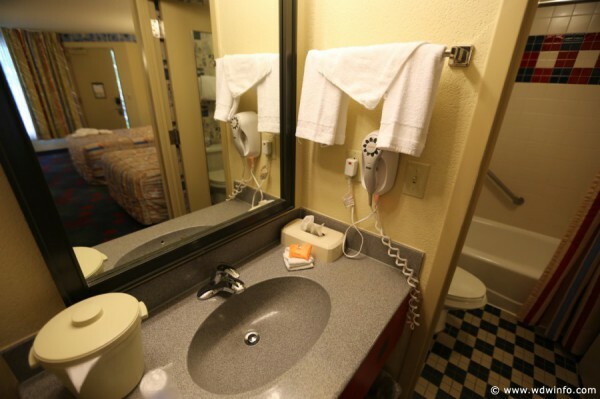 The bathroom area is small, but functional. A curtain separates the area from the sleeping portion of the room. I read a lot of criticism about this, but it has never been an issue for us, especially since the restroom and bathing area (not pictured, but to the right) has a door and lock. I am always the first one up in the morning and simply close the curtain before turning on the lights to dress and shower. I always find my people still sleeping when I'm done, so again, not a biggie. To the right, you will see a "closet." There is also a safe in the wall, which we make good use of. The area is more than enough room for our unused luggage, dirty laundry hamper, and hanging outfits. We use the top shelf for food and treats. So all in all, it's more than enough space for my family of four. than one person to be in there at a time. 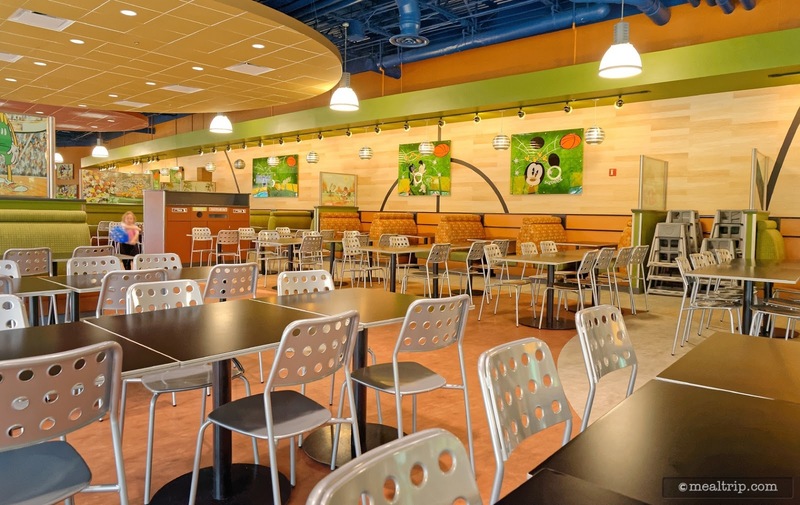 I borrowed the above photo as well, but I wanted to show the food court. 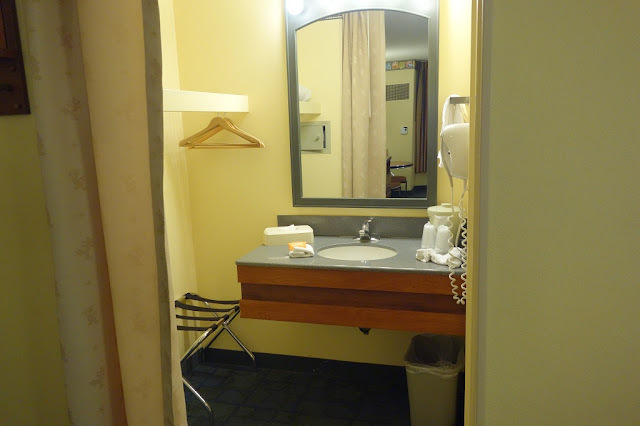 It was newly renovated prior to our stay, and as you can see, had a wonderfully modern fill. We didn't eat a single meal in the space, but I did take Ellie for an afternoon snack while Eric and Eli napped. The menus were standard with burgers, pastas, sandwiches, and an assortment of snacks and treats. Hands down the best value at Disney World is the resort pizza. 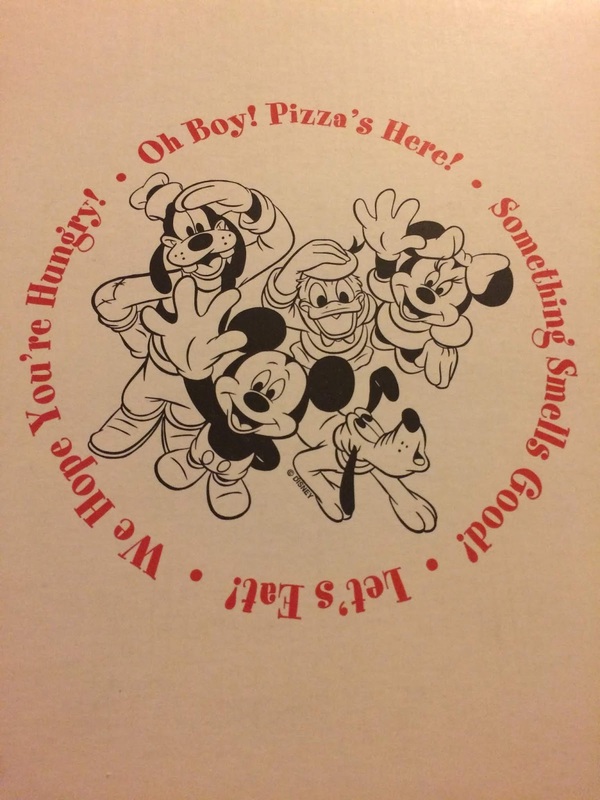 It's $14.99 for a large and they will give you complimentary plates and napkins. If you aren't on the meal plan, I would highly recommend this option. We keep chips and drinks in the room, so we can make a pretty decent meal out of this. We didn't schedule much time for swimming into this particular trip, which is something that I we plan to change on our next trip. However, we did make good use of the baseball pool. It is incredibly well-themed and quiet. Lifeguards were on duty and so, so good with the kids. Here's a little example: Instead of blowing his whistle at Ellie for running, one lifeguard got down on her level, told her she looked like a Disney Princess and asked if she'd ever seen the Little Mermaid. When she nodded yes, he asked her to remember how slowly Ariel walked when she became a human and to try to remember to do the same thing around the pool. Ya'll that's magical! The main pool was in the surf area. They had a lot of fun activities and games throughout the day. One afternoon Eric got caught up in some kind of group game with a beach ball. It's a fun atmosphere but also gets to be more crowded than the quiet pool. We tend to navigate to the larger pools during the day and the quiet pools after a long day in the park. 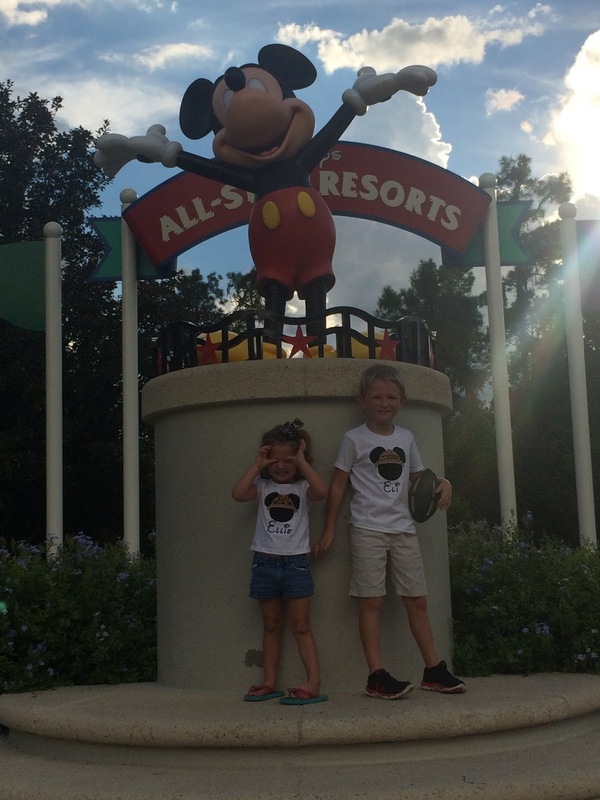 Ya'll, I can not tell you how much I recommend staying on property at Walt Disney World. The convenience of having nearly 24 hour transportation around the resort cannot be beat. Having the opportunity to escape the crowds and come back in the middle of the day for a rest or swim makes the trip so much more relaxing. I hear families complain about needing a vacation after Disney, and that's so sad. You can relax, slow the pace and enjoy the experience, and I think staying on property goes a long way in helping do that. The main reason we stay on property is because it extends the magic beyond the parks. Even the music on the buses is themed to heighten the experience. For my family, the Value Resorts offer us an opportunity to enjoy Disney World that we would not otherwise have. 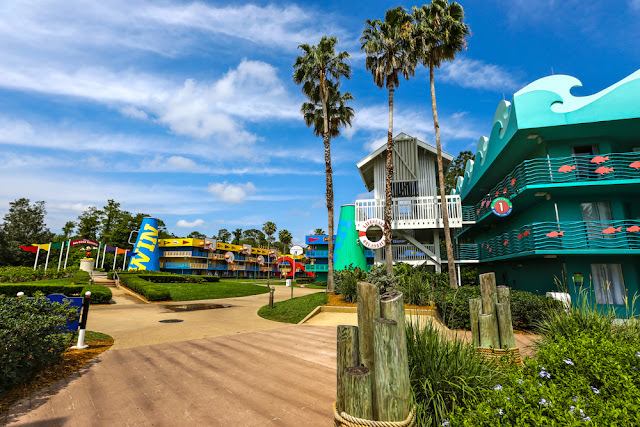 I know it's fun to daydream about the Deluxe Resorts and the countless amenities, but at the end of the day, we're all in the same parks, watching the same shows, and waiting in the same lines. 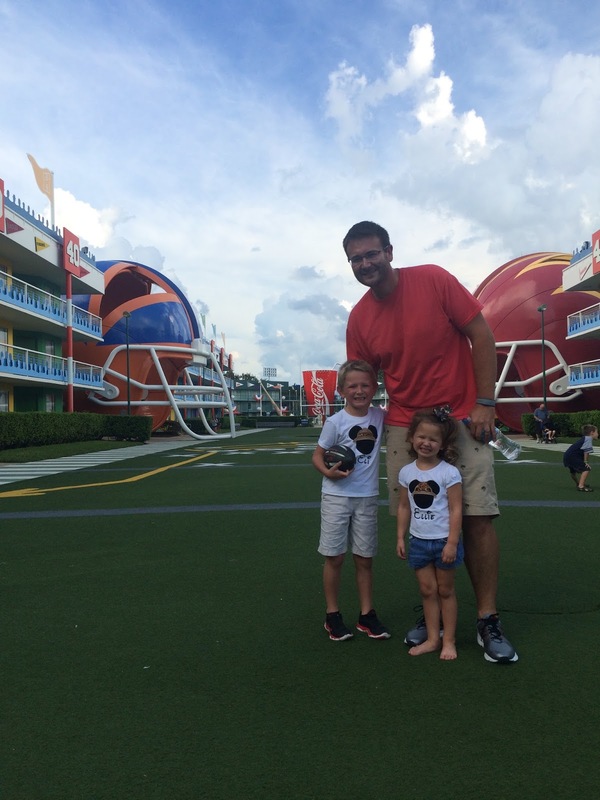 All-Star Sport resort was perfect for my sports-loving family, and we cannot wait to take our next trip! I LOVE the story about the lifeguard! That’s so Disney- the above and beyond!